It’s both a great and awful time to present this design. Great for Lodz president Hanna Zdanowska, who is just 2 weeks from elections and desperately needs the support of Widzew’s fanbase. And in all fairness she earned it. Despite numerous setbacks of her initial attempts over the past three years, Zdanowska eventually became the only president of the city who managed to redevelop not one, but both largest stadiums that were falling in despair for many years. Construction of the ŁKS ground is under way, while financing and contract for the one presented today are already secured. But then there’s the dramatic situation of Widzew. One of Poland’s most followed clubs meets the stadium design while being bottom of 1. Liga (second league) and with huge financial issues. One may only hope the trouble will be over once the stadium is opened in early 2017, but returning to the historically earned place among top clubs of Poland may be more challenging. 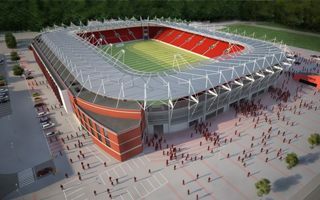 Ahead of the complete re development of Widzew Łódź’s stadium, the pitch will be relocated 20 meters east to accommodate a much larger main grandstand. Single-tiered seating bowl will allow for 18,018 people to get inside the stadium, while also providing for easy expansion. Very simple in terms of structure, the stadium will have a distinctive main western stand. There the architectural concrete and glass will be combined with brick cladding, loosely associated with the city’s industrial heritage. Aside of the main stand, all other parts of the stadium will be covered only with decorative mesh in a cost-cutting attempt. The impressive side will house nearly all necessary infrastructure on four floors. Facilities for players, club offices, hospitality (24 skyboxes) and media zones will all be located here. Additionally, the southern stand (for most dedicated fans) will have ground floor commercial spaces for lease. Demolition of the old stadium is to start in December 2014, after which delivery of the new ground should take roughly 2 years. Foundation works should begin in early 2015 and opening is expected in early 2017.